Utah lawmakers’ plan to scale back a voter-approved Medicaid expansion has passed a key vote despite protests from advocates who say it guts a plan the majority of voters want. The Utah House of Representatives passed the measure Friday that would provide insurance under Medicaid for about 50,000 fewer people than a proposal supported by voters. The measure was passed with about three-quarters of the chamber voting in support and a few of Republicans joining Democrats to oppose it. If the U.S government does not approve the plan, though, the measure would revert back to much of the voter-approved proposal. GOP legislative leaders say the changes are needed to control costs, though Democrats say less-drastic changes could address any potential future overruns. The bill now goes back to the Senate for consideration. 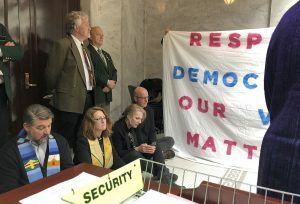 Protesters against Utah lawmakers’ efforts to scale back the voter-approved Medicaid expansion blocked the entrance of the House of Representatives as lawmakers debated the bill. The religious leaders were singing songs like “We Shall Overcome” as they knelt in front of the doors to the chamber on Friday. Advocates say the plan to cover 50,000 fewer people than the law that won at the ballot box thwarts the will of the voters and slashes potentially life-saving health care coverage. But lawmakers say the voter-approved plan doesn’t raise enough money to pay for the expansion long-term, and changes are essential to keep it from eating into other parts of the budget. The bill that’s moving quickly through the Legislature would require a federal waiver that would be the first of its kind.